Oil restrictors are needed for journal bearing turbos when their experiencing too much oil pressure. The oil restrictor has a .060" hole, which reduces the amount of oil going into the turbo. 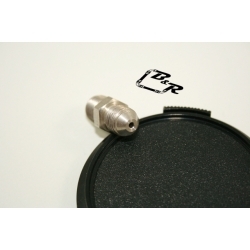 We now carry oil restrictors for 1/8"npt and 1/4"npt oil inlet turbos. Please choose the proper size for your turbo application. Garrett recommends using an oil restrictor in a journal bearing turbo if your are having oil leakage due to high oil pressure. Remember to address all other potential causes of leakage first (e.g., inadequate/improper oil drain out of the turbocharger, excessive crankcase pressure, turbocharger past its useful service life, etc.) and use a restrictor as a last resort.